Is your protein shake destroying your bones? It's important to get enough protein in your diet, particularly if you're trying to build or maintain muscle without gaining fat. But there has been some concern about whether consuming extra protein was safe. Some studies found that taking in more protein through your diet can cause you to release more calcium in your urine. Researchers became concerned that the bones weren't getting enough calcium and that the high protein could promote bone breakdown. Others said that consuming more protein actually increased calcium absorption and that the bones were fine. So who was right? Will drinking a protein shake hurt your bones? 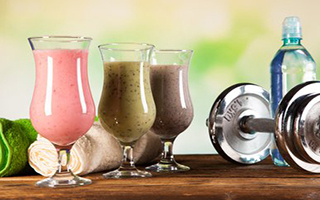 According to a study published in April 2015, your protein shake isn't hurting your bones. In order to determine this, the researchers conducted a randomized, double-blind, placebo-controlled experiment with 208 participants. All of the participants were older and had body mass indexes between 19 and 32. They were taking in between 0.6 and 1.0 g/kg of protein a day. The researchers asked them to increase their intake by adding either a 45 gram whey protein or an isocaloric maltodextrin (placebo) supplement to their diets. They consumed the supplement for 18 months, but didn't change anything else about their diets. Boost Your Nitric Oxide Levels With L-Arginine, Right? Wrong! At the beginning of the study, the nine-month mark, and at the end, the researchers evaluated the participants' bone mineral density using dual-energy x-ray absorpitometry. They also checked their skeletal and mineral metabolism. They didn't find much difference between the two groups in terms of bone mineral density, but the group consuming more protein had much better truncal lean mass than the placebo group. This is good news if you like to supplement with whey protein, such as that found in Advanced Protein Powder. I've been so impressed with this clean, easy-to-digest, grass-fed protein powder. I have tried to replace my afternoon reach for a sugary bar with Advanced Protein Powder and some strawberries and if I'm really hungry a teaspoon or tablespoon of coconut oil. This will hold me through the afternoon and allows me to eat a bit less at dinner. If you're trying to increase your protein intake, try adding the powder to a smoothie with some fresh fruits and vegetables. You'll get double the benefits!